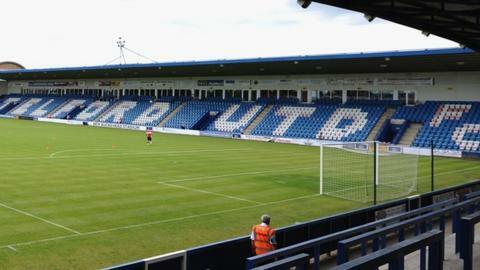 AFC Telford United chairman Ian Dosser says the club are unlikely to appoint a new manager before their next game. After Liam Watson was sacked by the Conference club, managing director Lee Carter said he wanted a swift decision. However, in a statement on the club website, Dosser said: "We have a shortlist of impressive candidates who we have already started interviewing. "It was our original intention to complete this process in time for Saturday's game. This is now unlikely." BBC Radio Shropshire reports that Solihull Moors boss Marcus Bignot turned down the chance to be on the shortlist for the job. Former Queen's Park Rangers defender Bignot, 40, began his playing career with Telford and is in his fourth season in charge at the Conference North club after spending seven years as manager at Birmingham City Ladies. Telford, who currently lie bottom of the Conference, and host Eastleigh on Saturday, are 10 points behind 20th-placed Southport, the team immediately above the relegation places. Dosser also confirmed that player-coaches Andy Todd and Andy Pryce will prepare the team for the game.